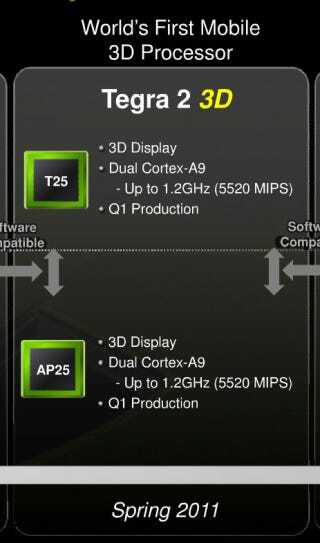 A leaked slide from Nvidia's Mobile World Congress presentation has revealed that the 1.2Ghz Tegra 2 3D processor, meant for mobiles featuring 3D screens, wil launch sometime this quarter. Mobile 3D computing for everyone! Trends seem to indicate our portables will boast 3D in all sorts of ways in the near future, the Nintendo 3DS chief amongst them, so this little leak isn't exactly a surprise. It can be reasoned coming mobile handsets will offer a Master Image TN-LCD display using cell parallax, a technology using the individuals cells to create a 3D effect instead of a parallax barrier, as Nintendo will be using in its 3DS console.